Athletic Club, most often known in English as Athletic Bilbao, is a football club which plays in Spain. The club formed from a merger of two football clubs ; Bilbao F.C. and Athletic Club in 1903. Winners (8): 1929–30, 1930–31, 1933–34, 1935–36, 1942–43, 1955–56, 1982–83, 1983–84. Runners-up (7): 1931–32, 1932–33, 1940–41, 1946–47, 1951–52, 1969–70, 1997–98. Winners (23): 1903, 1904, 1910, 1911, 1914, 1915, 1916, 1921, 1923, 1930, 1931, 1932, 1933, 1943, 1944, 1944–45, 1949–50, 1955, 1956, 1958, 1969, 1972–73, 1983–84. Runners-up (13): 1905, 1906, 1913, 1920, 1942, 1948–49, 1952–53, 1965–66, 1966–67, 1976–77, 1984–85, 2008–09, 2011–12. ↑ Note:The number of Copa wins Athletic Club have been credited with is disputed. 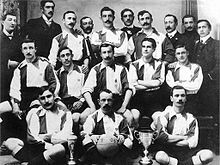 The 1902 competition was won by Bizcaya, a team made up of players from Athletic Club and Bilbao FC. In 1903 these two clubs merged as Athletic Club. The 1902 cup is on display in the Athletic museum  and the club includes it in its own honours list. . However LFP and RFEF official statistics do not include this as an Athletic win. This page was last changed on 16 April 2018, at 03:08.